You are riding the motorcycle shown, what would you need to do to be able to see the car? You are riding the motorcycle shown, what would you need to do to be able to see the car? A. Take off your helmet. B. Look in the mirror. Correct. Your mirrors may not cover the whole of the lane next to you, so you will need to turn your head to look in your blind spot for other vehicles. When learning to ride your bike start in quiet streets with little traffic. Build up your confidence before you take on motorways and busy urban streets. Learn the characteristics of your bike and develop your reflex actions so that you are braking, accelerating, indicating and cornering without having to think about how to do them. As you build up your skills your ability to concentrate for longer will improve. But be aware of fatigue, alcohol, medication and illegal drugs as they will all have a negative impact on your ability to ride. Riding a motorbike is more tiring than driving a car. Use the correct riding posture - a relaxed riding position - to reduce fatigue and improve control. Sit on the bike so that you can reach the handlebars with your arms slightly bent - this will allow you to have fast effective control without affecting the balance; sitting too far back will affect the weight distribution and make the steering feel light. Look directly ahead of you where you want to go, not down at the road immediately in front of you. Sticking your knee out when cornering is not a good or effective riding style for the road. It increases your wind resistance and you are at risk of catching your knee on uneven tarmac and injuring yourself. This technique should only be used on the race track where the tarmac is smooth and you can wear a knee slider. 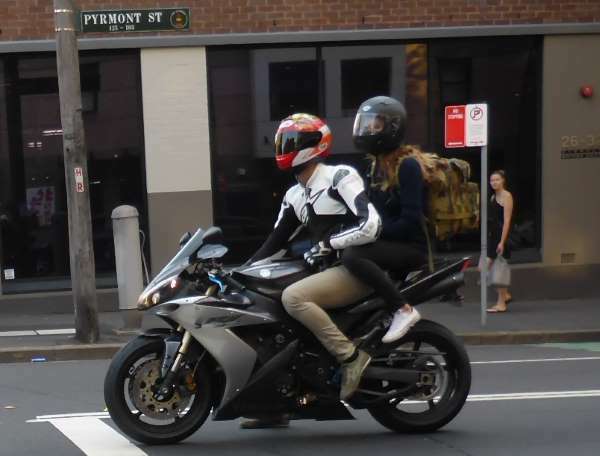 You must not carry pillion passengers until you are on your P2 licence and have held a licence for at least 12 months, and then only if your motorbike has the right fitments to accommodate a pillion passenger. It will need separate footrests and a pillion seat. You must be able to ride the motorcycle in your usual position when carrying the pillion passenger, and your bike must be capable of maintaining open road speed. Read our guide to carrying a pillion passenger here. Pillion passengers must sit astride the bike, not sideways, and be at least eight years old. Passengers must not operate the controls of the bike. Only one extra passenger is allowed to be carried on the motorbike itself. If you have a sidecar then you can carry a passenger (or passengers if there's more than one seat) in the sidecar, too. Children under eight are allowed to travel in the sidecar. It is the law that pillion passengers must wear an approved helmet (here's an article about helmet standards). The pillion passenger should lean with you around corners otherwise you will find it difficult to turn and it will make your bike less stable while turning. When braking, the front wheel provides between 75-90% of the braking force. When you start to brake you should apply the front brake before the rear. The rear is more likely to lock because there is less weight over it as the weight shifts forward during braking. Normal braking involves both the front and rear brakes. As motorbike tyres only have a small contact patch with the road, braking should be done upright and in a straight line. This is because in a corner the tyres have to deal with cornering forces. To add cornering and braking forces together increases your risk of having an accident. The same applies for changing down so that you are using engine braking. Engine braking applies retarding force to the rear wheel. If you are already braking and then change down the extra braking force on the rear wheel makes the wheel easier to lock. For this reason you shouldn't change down in the middle of a corner - do all your gear changes on the straight. As you slow down to a stop, downshift before stopping as downshifting helps with braking and ensures you're in the right gear if you need to accelerate again. 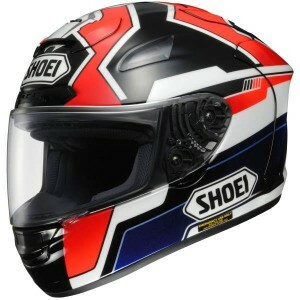 A helmet is compulsory and it's the law that you must wear an approved helmet. Other protective clothing such as a jacket with strong fabric and spine and kidney protectors, tear-resistant pants, gloves and boots with shin and ankle protection aren't compulsory but are recommended for your safety as they will reduce your chances of serious injury in an accident. If you wear glasses or sunglasses you should also wear a protective visor because glasses and sunglasses are not strong enough to protect your eyes if a stone is thrown up at speed from a passing vehicle. You risk being blinded if you don't take adequate measures. Protective clothing should be comfortable without being loose. Loose clothing can be dangerous if it gets in the moving mechanisms of the motorcycle. Very tight clothing could restrict your movement. Protective clothing should also keep you warm as hypothermia can be a risk in colder areas with the wind chill of travelling through the air at speed. This reduces your reaction times. Bright or fluorescent clothing is best for visibility. If you are riding a new motorbike then you must familiarise yourself with the controls before you set off, and allow extra stopping distance as you won't know what the braking performance is. Always check that your front and rear lights and front brake are working before you set off. Your mirrors should be set so that you can see over your shoulder and back up the road. You will have blind spots - the mirrors won't cover everywhere. You should be able to see about half the lane behind you and as much of the lane next to you as possible. Quickly check that the throttle isn't sticky. If the throttle does stick, you can simply pull in the clutch lever, turn off the engine at the cutoff switch and apply the brakes. When following a car position yourself so that you can be seen in the car's rear view mirror and so that you can see ahead. Don't follow too closely. You will be able to see through the car's rear window, and you'll need to keep an eye on its brake lights. Stay in the centre-left of your lane to give you a bit of a buffer against oncoming traffic, unless you are passing a row of parked vehicles, in which case you should move to the right of the lane in case a door is opened in front of you. Only move to the left of the lane if there's a wide vehicle coming towards you or if you could be more visible to traffic that might turn across in front of you. When you are being overtaken stay in the centre-left of your lane, but be careful of large vehicles as they can create buffeting in their slipstream, and they also might shelter you from any crosswind temporarily, and once past you could be hit with a crosswind that unsteadies you. Cancelling your indicators is important on a bike as if you leave it on after a turn a vehicle could think you are going to turn and could pull across in front of you. You should always perform a head check (turn your head) before you change lanes or turn into a side street or driveway so that you can see if there's anything in your blind spots. On wet roads painted lines and manhole covers will be extremely slippery. You may also experience spray which reduces your vision through your visor, and glare off wet bitumen. Stopping distances will be longer in the wet, and it will be more easy for you to wheelspin, especially in low gears. If it hasn't rained for a while a layer of rubber, dust, oil and dirt builds up on the road. When water first falls on this, it forms an extremely slippery layer until it's worn or washed away, so be extra careful in these conditions. The centre of the lane will be more slippery than where other vehicles drive. When there's sand or gravel on the road, slow down by braking in a straight line otherwise your front wheel could wash out from under you. Keep your feet firmly on the footpegs and your centre of gravity low to help control any skids, but be prepared to put a foot down to act as an outrigger if you need it. Don't make any sudden manoeuvres as this can cause you to skid. When riding on bumpy roads, keep a tight hold of the handlebars. Rise in your seat slightly. Don't worry about the bike moving about underneath you too much - let it move a little and don't try to fight every little movement. If you are riding at speed and get a high-speed wobble, close the throttle and allow the bike to slow down naturally; you will regain control. Don't hit the brakes as this could cause an accident. Other vehicles find it more difficult to judge the position and speed of motorcyclists in the dark because there's only one point of light as a reference. Also, your view of obstacles and the road is reduced, therefore it makes sense to take it easy at night. If you have a blowout or puncture the first thing to do is close the throttle and let the bike coast to a stop. Keep a firm hold on the handlebars and try to avoid turning. Don't let the bike control you - stay in control. If the rear tyre blows then you will be able to use the front brake to help you slow down, and if the front tyre blows you will be able to use the rear brake. But don't brake heavily unless you need to to avoid an obstacle or scrub off enough speed before a corner. Braking heavily on the rear wheel can cause a skid quite easily. In the case of a front wheel puncture, keep your weight more on the back wheel. At low speeds you will notice that the steering will feel heavy. If you try to turn, the tyre could roll off the rim and the bike will slide from underneath you. In the case of a rear wheel puncture the first thing you will notice is that the back end of the motorbike will want to slide from side-to-side. Rear-wheel slides are not that difficult to control unless you let them get too far around, in which case they can highside you (flip you off the bike). To keep yourself appraised of the situation ahead, use scanning. Scanning means you are constantly looking for potential hazards, keeping your eyes moving and checking all areas. You will be looking in the distance, at the road surface, to your left and right, and regularly at your mirrors and instruments. This will give you the best chance of responding in time to any changing traffic conditions. The usual reaction and response time to a change in traffic conditions is around three seconds, which is why it's safest to stay three seconds behind the vehicle in front. A low risk rider is one that uses scanning and checks mirrors frequently to assess their position. Always look to create a buffer between yourself and any other vehicle on the road. If you are the rider approaching this junction and waiting to turn right, it's best to stop and let the car turn first because the car blocks your view of oncoming vehicles. If you are passing straight through, slow down and move left in your lane to increase your visibility of the situation and give you an extra buffer - more time to react if the vehicle pulls in front of you. Riding a motorbike is all about being as visible as possible. When you are merging and pulling onto another road, your indicator will be visible on the side of your bike and will attract the attention of other road users. If an oncoming vehicle seems like it might turn across in front of you, check your mirrors, move left in your lane and slow down. You should check your mirrors because you might need to take evasive action and knowing what's either side of you and behind you improves your options. If you are taking a left curve plan to finish in the left-hand part of your lane. This gives you some margin of error - you don't want to be crossing the centre line into the path of oncoming traffic.